Home › 70's Cinema › Best Movie Recipes! 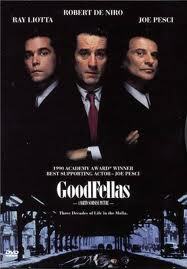 “Goodfellas” Garlic, Belushi Food Fights + Big Nights! 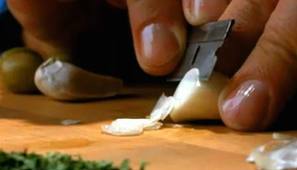 “Goodfellas thin”: The unofficial measurement of a slice of garlic cut extremely thin using a razor blade. In 1990, Scorsese teamed up with Robert DeNiro to tell the story of Henry Hill, the young kid who worked his way up through the mob hierarchy, only to see it all fall apart. Ray Liotta is brilliant as the young mobster, and DeNiro plays James Conway, the guy who helps Hill get into the mob, only to betray him in an effort to save himself. Joe Pesci won the Oscar for Best Supporting Actor for his portrayal of psycho gangster Tommy DeVito – I have included the infamous “but I’m funny HOW?” dialogue at the end of this post, one of the film’s many iconic moments. This classic film lost Best Picture to “Dances With Wolves”, but Scorsese was at the top of his game here. We all know that. 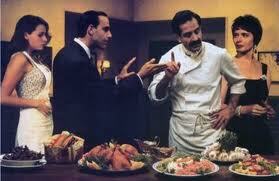 What is easy to forget is how much Scorsese’s love of food permeated the film. Scorsese’s mother, Catherine Scorsese, shown above at the dinner table, plays Tommy’s mother. She and the cast ad-libbed this dinner scene. Scorsese’s father, Charles Scorsese, plays the prisoner who puts too many onions in the tomato sauce…the prison scene that introduced America to the “Goodfellas thin” slicing of the garlic! Blend bread crumbs into meat mixture. Slowly add the water 1/2 cup at a time. The mixture should be very moist but still hold it’s shape if rolled into meatballs. (I usually use about 1 1/4 cups of water). Shape into meatballs. There you have it, Meatballs ala Goodfellas…you must have a lot of red wine with this. 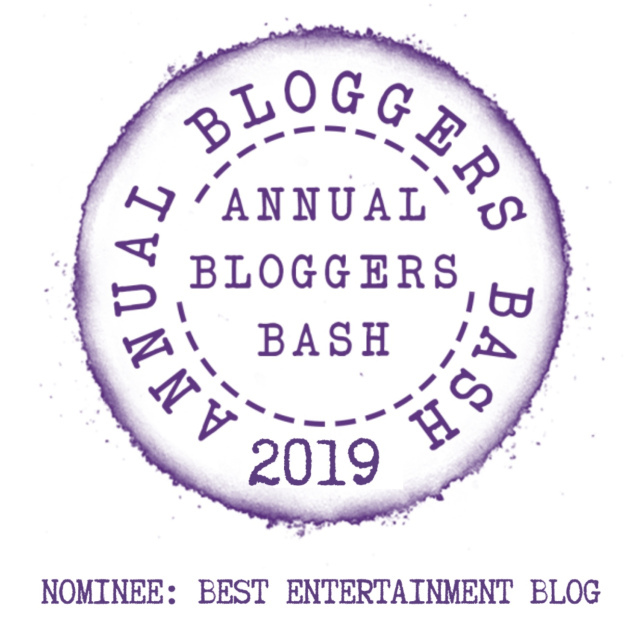 A good Chianti, Sangiovese, Zinfandel – or all of them! 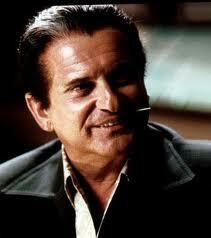 And here is the famous scene in which Joe Pesci busts Ray Liotta’s balls…. 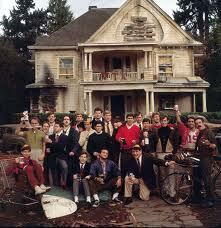 National Lampoon’s Animal House. Ok, this classic comedy is known for so much: Togas! “Double Secret Probation” – NIEDERMEYER! But Animal House also has the best food fight since the Marx Brothers! It all begins one day in the school cafeteria, when John “Bluto” Belushi takes a slow “stuff your face with food” crawl down the cafeteria line – eating, slurping and pocketing a massive amount of food – and piling up his tray. Let the food fight begin! In honor of John Blutarsky – Bluto! – here is the perfect recipe for a “jiggly jello” concoction to use when you replicate this scene for friends and family! Mix the jello according to instructions, then add the cottage cheese, oranges, pineapple and cool whip. Refrigerate until ready to pop! Big Night. Many consider this to be the best movie ever devoted to food. This 1996 labor of love is starring Minnie Driver, Tony Shaloub and Stanley Tucci – AND DIRECTED BY- Stanley Tucci and Campbell Scott. Two brothers struggle to save their failing restaurant by putting on a “big night” for a celebrity. They make one of the greatest dishes ever – a Timpano – and as you watch it come together you will need to eat one, so here is the recipe from the film! To make the pasta, mix the flour and the salt together, then stir the salted flour with the eggs and the oil. Continue to stir until the dough comes together in a ball. On a floured work surface, knead the dough for 10 minutes, or until silky smooth. Wrap with plastic and set aside at room temperature for at least 1 hour. Combine all the meatball ingredients. Roll into about 65 balls, using 1 tablespoon of meat for each. In a large nonstick frying pan, cook as many meatballs as will fit in 1 layer over medium heat, turning occasionally, for 20 minutes. Repeat if necessary. Set aside in a bowl at room temperature. In the same pan used to make the meatballs and utilizing the fat left in the pan, cook the onion, carrot, celery and garlic over medium heat for 8 minutes, stirring occasionally. Dissolve the tomato paste in the stock or wine and stir into the vegetables. Cook the mixture for 1 minute. Stir in the tomatoes and basil. Simmer for 30 minutes. Season with salt and pepper to taste and set aside. To make the timpano, preheat the oven to 350 degrees. Toss the penne with 2 cups of the sauce. Roll out the pasta on a lightly floured surface to make a 26-inch round. Grease a 3-quart stainless- steel bowl with 2 tablespoons of oil and gently mold the pasta sheet to the contours of the bowl; there should be enough hanging over the edge to fold over and cover the filling. Spoon 1 cup of penne into the bowl. Top with 1/2 cup of the sauce, 12 pieces of egg, half of the meatballs and 1/3 of the mozzarella. Repeat the process, this time using 3 cups of penne, 1 1/2 cups of sauce, the remaining eggs, meatballs and cheese. Top with the remaining penne and sauce. Create a final layer with the salami. Fold the pasta over the filling and brush with 1 tablespoon of oil. Cover tightly with aluminum foil. Bake the timpano for 45 minutes. Remove the foil and bake for 45 more minutes. To check if it’s done make a small hole at the top using a knife blade. If steam comes out and the cheese is melted, it’s done. Otherwise, bake for 10 to 15 more minutes. To serve, remove from oven and cool for 5 minutes. Carefully turn upside down onto a large platter. Also…At the end of the movie, there is a static 4 minute scene involving a single fried egg – the shot above captures the exact camera shot – a moment of simplicity that is full of unspoken emotion between the two brother – it will make you cry. Just three examples of great food moments in the movies…I will be adding more posts in the future, adding more films and cleaning up old posts…thanks for bearing with me! ‹ Ninja Warriors! Mt. Midoriama! Cosplay! Tokyo Lights! Tokyo Nightlife!